Today was gorgeous! Blue skies, sunny and warm, it must have hit 23 degrees! (That's Celsius, for my American friends!) It certainly held promise of the summer to come! It made me remember the summer days when my kids were little, and a sound I dreaded above all else! It was a tinny rendition of The Entertainer, playing over and over and over, throughout the neighbourhood, gradually getting closer and louder. My girls would eventually become aware of it and the next thing I would hear would be the screen door slamming as they ran in the house screaming, "Ice cream truck! Ice cream truck! Can we have money?" Which would have been okay if it was once every two weeks or so, but this happened almost every other night! You get tired of saying no all the time, and strangely, it wasn't quite enough motivation to get the girls to do chores in order to earn themselves some ice cream money! 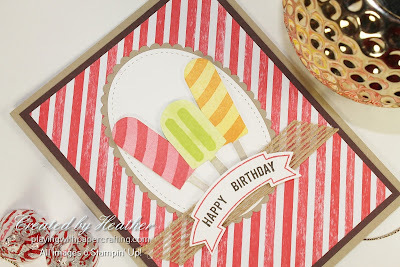 But ice cream treats and summer do go hand-in-hand! 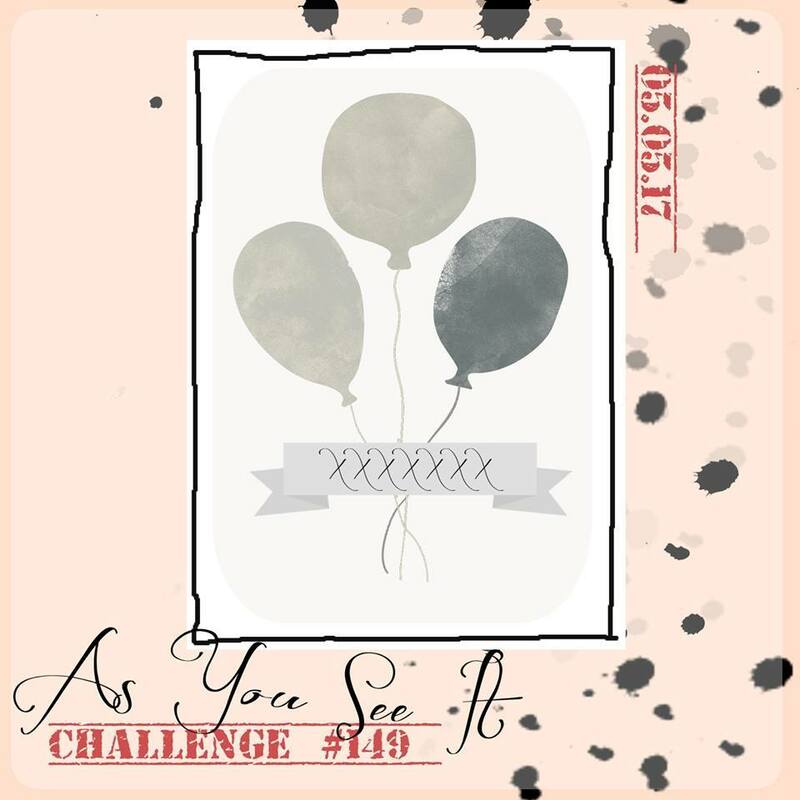 So when I saw the sketch for As You See It Challenge #149, it was the first thing that came to mind! I just haven't been able to get enough use out of the Cool Treats bundle from the Occasions Catalogue. I suppose I've been waiting for the weather to warm up a bit to get in the mood! Luckily, this set is not retiring. It will be seen in the new 2017-18 Annual Catalogue, although not as a bundle. So if you want the Cool Treats Stamp Set and the Frozen Treats Framelits Dies, you can save yourself 10% by getting it now, before May 31st! 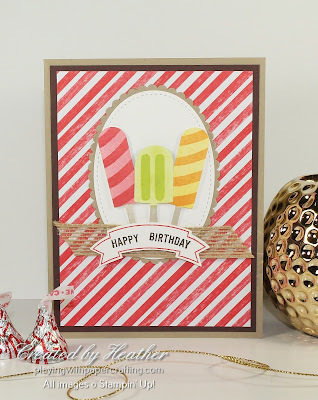 I used the Tasty Treats Specialty Designer Series Paper as the background for this card. It will be retiring on May 31st, just like all current DSP, so this is something you should definitely get before the deadline if you like it! 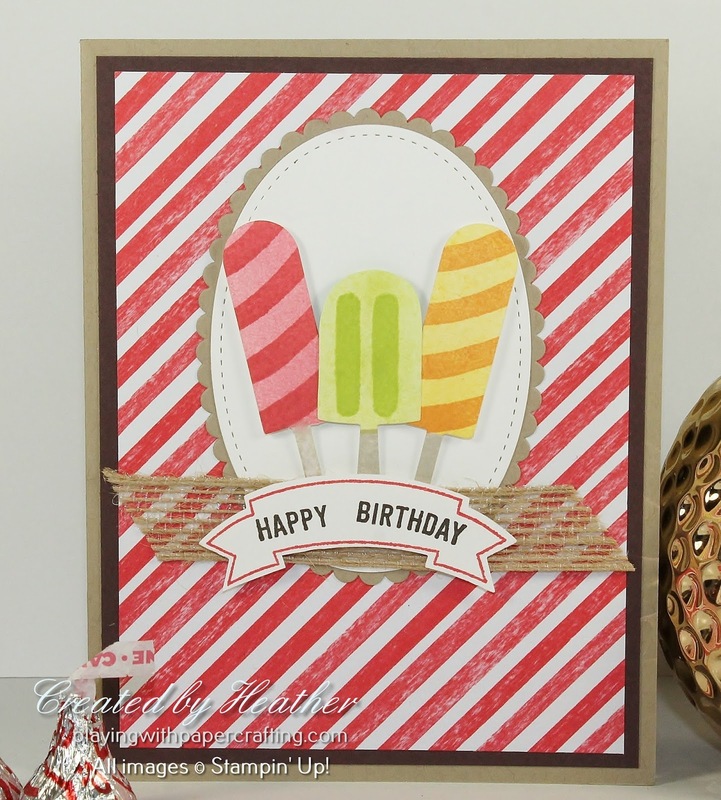 It's so much fun figuring out what colours to use and how to design all the tasty treats. There are so many options. I haven't even tried the ice cream cones yet! I used Daffodil Delight and Peekaboo Peach on one, Flirty Flamingo and Watermelon Wonder on another and on the middle one I used the new Lemon Lime Twist*. I stamped off once for the lighter base and used it full strength for the indents in the middle. I needed to add the Stitched Shape Oval and Layering Ovals Framelits in the back because otherwise they got lost on the striped paper. 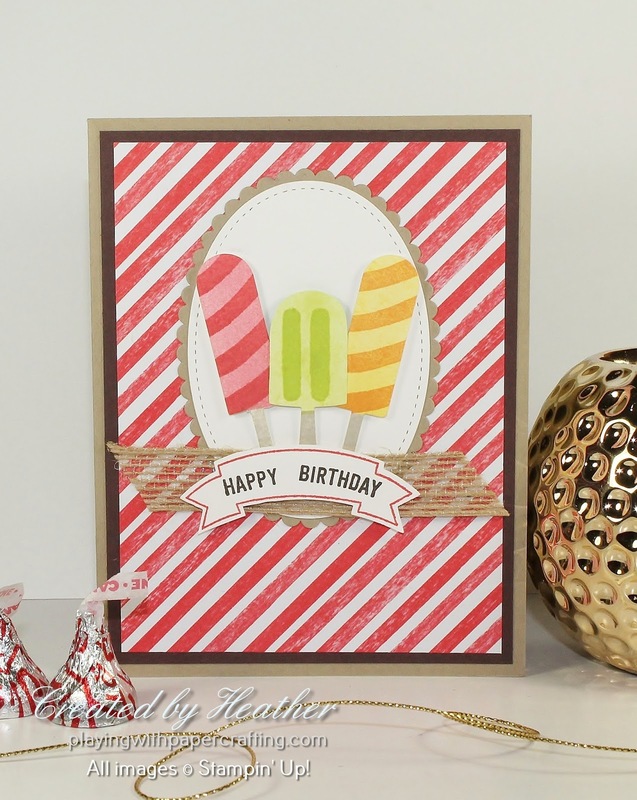 The sentiment is from Thoughtful Banners stamp set which coordinates with the Duet Banner Punch. Both of these will still be around in the new Annual Catalogue, but not as a bundle again, so here is another instance where you can save 10% by acting now. The Burlap Ribbon added a fun bit of texture to the whole design. I hope you have time to pop on over to As You See It Challenges this weekend and play along with this challenge and have a little stamping fun this weekend! I'll leave you with the links to the Retiring Products. Place your order anytime on my On-Line Store or message me with your order. Just click on each banner to see what's still left and all the great deals you can get!